Cast: Takeuchi Yuko, Kanjiya Shihori, Takito Kenichi, Nakamura Tomoya, Otani Ryohei and Ozawa Yukiyoshi. This is a Japanese version on the classic story of Sherlock Holmes. After spending time in war-stricken Syria, the empathetic and likeable doctor Tachibana Wato (Kanjiya Shihori) returns home, only to witness the death of her mentor. This leads to her meeting Sherlock (Takeuchi Yuko), a “consultant” to the police. 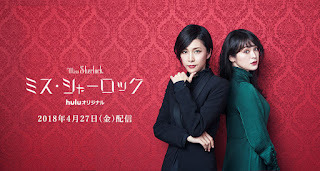 Arrogant, unapologetic and with bad social skills, Sherlock is a master in deduction, and runs her own detective agency - but occasionally helps the police out in cases deemed ‘bizarre’ or ‘weird’. Being a fan of the original works, I had to watch this thing. Not only is the leads female, they actually are FEMALE! Lol! I love how natural and perfect they were for their characters, especially Wato (Watson). I know the main lead is Sherlock, but she was kind of like the “typical Sherlock” you would see. I love how human Wato was, but then again Watson is the one character I like more in the original story as well… Anyways.. The drama is well acted, the screenplay well executed, and storyline is also good. Though I felt the ending was a bit rushed, but that might be because there is so much happening, but oh well. To sum up: a good drama and an interesting watch.